I read a lot. Like, all the time. In fact I purchase books much faster than I can read them. I know, I know, I should have an e-reader of some sort, perhaps a Kindle or Nook, but I have an affinity for the tactile nature of holding a book in my hand. I like the way books smell and feel, so I’m analog in that way. I also like book shelves and stacking books everywhere. Anyway, my argument for analog can wait for another day (I’m probably going to buy the iPad the day it comes out even though I know a much better and cheaper version will probably come out six weeks later). 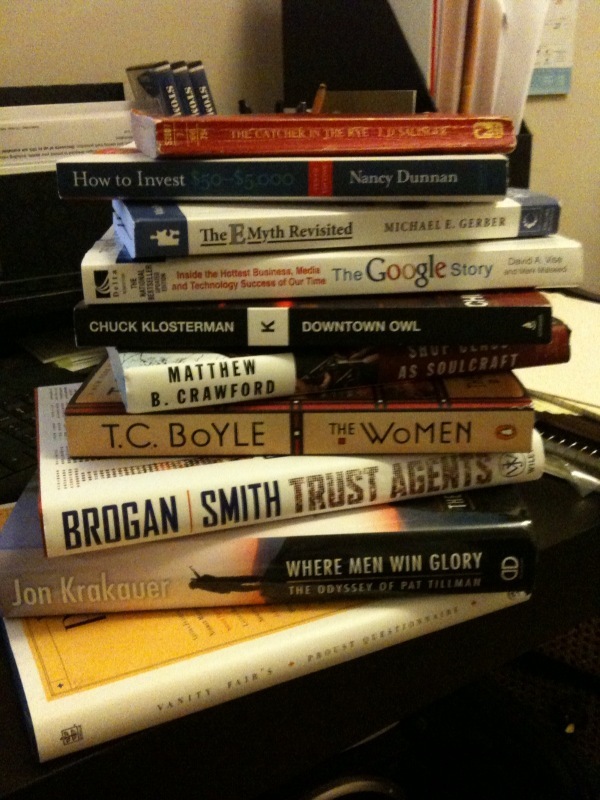 In the next two posts, I’ll just share the last 10 books I’ve read and why I recommend them. 1. The Catcher In The Rye by J.D. Salinger. I’ve read this book like 4 times, but since J.D. Salinger recently passed away, I thought I’d pay homage to him and Holden Caulfield and give it one more read. This one’s an obvious classic, about a teenager questioning the way the world works and looking for answers to questions that may not exist. If you haven’t already read this, it’s a must. 3. Downtown Owl by Chuck Klosterman. If you have spent any time in a rural area, ever in your life, you will love this book. Klosterman has quickly become one of my favorite offers for his verbose, resounding, intriguing writing style and knack for dissecting social idiosyncrasies. In this novel, his first, Klosterman’s characters inhabit a typical little town in North Dakota. Throughout the tale, one can’t help but relate what his characters experience to life in any small town. I blew through this one in a couple of days. It’s a good one. 4. The E-Myth Revisited, by Michael Gerber. This is basically Cliff Notes for starting a business. It’s sold something like a gizzillion copies in a bazillion countries. It should be on any business owner’s book list and should be written on, highlighted and gone through multiple times. There are tons of great ideas, although they aren’t all original or terribly complex. Even if you’ve been in business for a while, it’s probably a good idea to dust off that old copy you bought way back in the day and give it another read. Books like this one are good for getting your creative spirit up. Of course they run a consulting business so the underlying goal of the book, at least on some level, is to get you to call Michael Gerber and give him money to become your personal business coach (or at least one of his lackeys). 5. Where Men Win Glory, by John Krakauer. I’ve never met a Krakauer book I didn’t like, and this one definitely doesn’t disappoint. Even at 344 pages, you won’t be able to put this book down until you’re done. The concept is an in-depth and personal look into the life of NFL player turned Army Ranger Pat Tillman and the circumstances surrounding his death in Afghanistan. Krakauer, of Into Thin Air fame, spares no detail when describing the almost super-human, lovable Pat Tillman in this thrilling and sobering portrayal of his life and death. Don’t just read this book, read everything Krakauer has ever written. Also check out the Pat Tillman charity at http://www.pattillmanfoundation.org/ and donate if you can. Stay tuned, the next 5 are coming soon. And as a side note, I put a link to the books in Amazon solely as a reference for those interested. I have no affiliate relationship with Amazon nor do I stand to profit from their sale. I do recommend these books, but I don’t care where you buy them.